I am so pleased to take some time today to mention a few wonderful resources to help you on your journey to health and wellness. I'm passionate about feeling great. I love the way my body feels after a day of hiking or a brisk afternoon walk. I love the way I feel when eating clean, nutritious and wholesome food - energized and vibrant. And I love getting my usual eight hours of sleep a night (I'm not trying to make you mama's with little ones jealous, honestly. I was there but I made a point of napping almost every day during that stage of life, nearly five years, to not be running on empty). I just love the way I feel - healthy. I wish I could give that gift to each of you. Second best I suppose is directing you to resources that can help you achieve that. 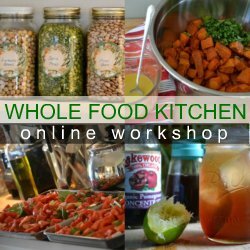 I'm so super pleased to announce that Heather is offering a three month course, starting February, called Whole Food Kitchen. I had the privilege of contributing to her summer 30 Day Vegan Course and I can't recommend enough the quality of Heather's teaching. If you read her blog (one of my faves) you know who she is and why you'd like to join her course. In Heather's words, "You will find my classes infused with a non-dogmatic, inclusive approach to nutrition. In life and in food, my focus is on simplicity, patience, keeping it real, and common sense." Heather's the real deal and I'll just tell you upfront I adore her (if this feels like I'm giving a sales pitch for a friend, I am). If you're thinking of joining the course, don't delay. Heather is extending her "Bring a Friend" deal till tomorrow, Tuesday, Dec 20th. I've started writing my pieces for the course and I can't wait to participate with all the other lovely contributors. I'm so happy to be a part of this - joining amazing real-life people to teach and encourage others in health and wellness. Someone who shares a similar passion to "equip moms to live vibrant lives" is Lisa Bryne at WellGrounded Life. I read Lisa's blog and subscribe to her e-newsletter and am continually impressed with the quality and content of what she shares. I especially love her videos. Some of those resources really helped me on my journey this year - discovering who I am and identifying tools for taking better care of myself. This summer I wrote a whole post on why I love Lisa's material so much. You can click over to read it if you want to know why I recommend her material so highly. I'm happy to promote Lisa's life changing work on my blog. I'm also an affiliate and earn a small commission if you sign up. I hope I've established myself enough as someone who only recommends what I love, so you know this isn't a money grab for me (just have to say that). Lisa is currently running a special offer on her course Designed For Wellness (you were designed to live life to the full - believe it). Till Thursday, Dec 22nd (New Years Day!) she is offering a two for one registration deal. Anyone that signs up for the course can gift a registration to another woman (or they can go halfsies on the registration fee). Good deal. Lisa also has some great free videos you can sign up to receive here. Free, that's a price we all can afford this time of year. I want to remind you all that my dear friend and mom, Karen Toews, has a nutrition blog Real Food Matters. My mom has the creds, the experience and true heart's desire to help you achieve better health. Mom regularly posts great recipes on her blog (my mom is an amazing cook!) but did you know she offers personal nutrition consultations? This summer we lived with my parents and I was "behind the scenes" to see Karen work hard to deliver the best to her clients. You're in good hands with my mom. The heart of a mother (& grandmother), the years of experience as a cook, the knowledge of a Registered Holistic Nutrtionist - I know my mom and I know she wants to help you be a "best" version of yourself - active, vibrant, energized - healthy! Taking care of our health - it's the best gift to give ourselves anytime of year. I encourage you to check out any of these three fabulous women to help kickstart your own path to better health. PS. Don't want till January 1st. There is no day like the present to make your health a priority. tara on Dec. 19, 2011, 7:32 p.m. Thank you for these links, Renee. I participated in Heather's summer course and really enjoyed it. I just may have to look into her Whole Foods course. I am way behind on my regular blog reading and was not aware that she was offering this course. 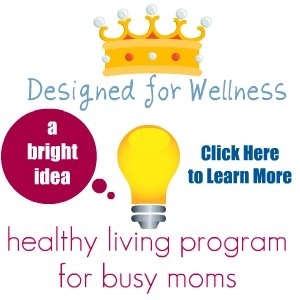 Your mom's blog also looks like a great resource for healthy eating. looking forward to finding a little extra time to look around. Shelley R. on Dec. 19, 2011, 8:06 p.m.
We've begun skiing as a family once again this year (not nordic though, not enough overall snowfall yet) and I've noticed how weary I am, how my endurance is lacking. We've altered our overall family diet as our kids began eating whole foods themselves as infants, and now we are mostly whole foods and organic. But there are no allergies in our family and so I have no need or motivation to stop baking muffins, cookies, and sweet breads (all that Norwegian heritage kicking in). But, my weariness after a great night of sleep? Mild migraines when I'm hydrated? There's room for improvement. So yes, thank you for the links, they are timely indeed as I've already begun researching what may need to change in our home--for myself and my family! Karen on Dec. 22, 2011, 12:45 p.m. Such a good message, Renee. This gift of health you give yourself- is the gift that keeps on giving to those around you. Thanks for pitching Real Food Matters. I am honoured to be in blog-company with Heather, and Lisa - I too am inspired by their presentation and appreciate their wholehearted approach.